When Isabelle Hawking and her Papa set out from London on a sea voyage, Isabelle was thrilled. Visiting foreign courts, learning from master tinkers, and studying new ways to manipulate mechanicals sounded like a dream. Isabelle’s excitement, however, is short lived. When an unexpected gale turns the waters violent, the ship is lost. Isabelle survives the tempest only to be shipwrecked on a seemingly-deserted island. Dotted with standing stones, faerie mounds, and a crumbling castle, the haunting place hints of a magical past. Isabelle may be an unwitting guest, but her arrival at the forgotten citadel heralds a new beginning for the beastly residents inside. In this tale as old as time, Isabella Hawking finds herself at the center of a heartbreaking mystery. 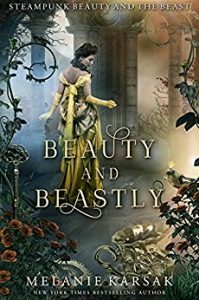 Beauty and Beastly is a steampunk retelling of the classic Beauty and the Beast fairy tale set in 1814 gaslamp Regency England.